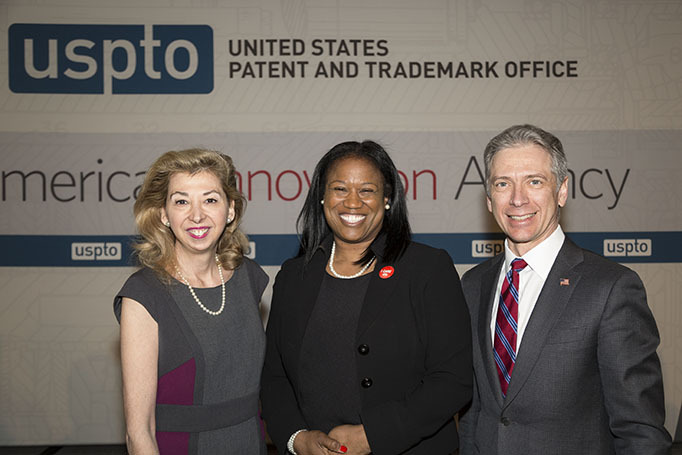 From left: Deputy Director of the USPTO Laura Peter, USPTO CFC Campaign Manager LaShawn Fortune, and Director of the USPTO Andrei Iancu. Photo courtesy of Amando Carigo/USPTO. Every year, federal government workers nationwide join in the Combined Federal Campaign (CFC) to donate funds and volunteer time to thousands of local, national, and global charities. The recently concluded 2018 campaign, which ran from September 10, 2018 to February 22, 2019, was no exception, and I want to publically commend the employees of the USPTO for continuing their proud tradition of giving. The CFC is a 57-year federal tradition that has raised more than $8 billion for charitable organizations. It is one of the world's largest and most successful annual workplace charity campaigns, with 36 CFC zones throughout the country and overseas raising millions of dollars each year. In the 2018 campaign, the total amount raised was over $35 million and participants pledged more than 56,000 volunteer hours. The USPTO was honored to be the lead agency for the entire Department of Commerce (DOC) during the campaign. Under the guidance of the USPTO CFC Campaign Manager LaShawn Fortune, Deputy Campaign Manager Alexa Neckel, and the Patent Trial and Appeal Board’s Troy Tyler, who served as campaign manager for the Department of Commerce, we raised more than $1.1 million, or roughly 45 percent of department’s total contribution. This is incredibly impressive! I was proud to see that our agency, which is charged with protecting and promoting innovation, itself put innovation into practice for this campaign. The USPTO’s campaign combined special events, videos, custom graphics, employee testimonials, and regular agency-wide promotions on behalf of those in need. Via the USPTO Weekly, employees shared their personal CFC cause, from local food banks and after school programs to raising awareness of, and finding cures for cancer and HIV/AIDS. During the CFC charity fair we held in December, employees had the chance to learn firsthand about the great charities involved in the campaign. In addition, we found that charities benefited from meeting each other. For example, at the fair, a charity that sent regular support shipments to Africa met a charity that made inexpensive but critical light sources for people in Africa that was having issues reducing shipping costs. Through some conversation, they decided to work together so that the light manufacturer could add his product to the other’s support shipments for little to no cost. From the beginning, the USPTO’s campaign emphasized how there are people all across the nation and the world, who need just a little help. A small donation can fund tutoring and job training sessions, provide food and shelter, help wounded veterans, bring adoptive families together, and so much more. The CFC gives us a chance to pull together and help each other to reach new heights, and we look forward to doing so again in the 2019 campaign. Thank you for your contributions and hard work.